RADIO DISNEY VP Programming/GM PHIL GUERINI shares with ALL ACCESS, "This past MONDAY, RADIO DISNEY joined forces with the DISNEY ABC TELEVISION GROUP Corporate Citizenship team to help inspire others to share how you #ChooseKindness, and end bullying this OCTOBER. 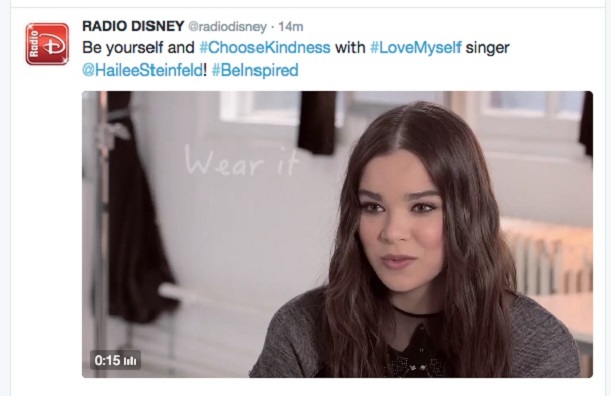 Thank you to our partners at REPUBLIC RECORDS, we engaged ACADEMY AWARD nominated Actress and Artist HAILEE STEINFELD to support this national Bullying Prevention Month of awareness by allowing us to capture the PSA below." GUERINI continued, "this piece and the song 'Love Myself' (#11 on this week’s RD ‘Top 30’ chart) became the basis for ABC NEWS 'World News Tonight' with DAVID MUIR and ABC NEWS 'Dateline' coverage, see the link below. Please take a minute to view these pieces and join us in this effort to #ChooseKindness and stomp out bullying. ABC News “World News Tonight” with DAVID MUIR segment. ABC Family :30 #ChooseKindness PSA.